In local communities, the civically engaged – the people who vote, volunteer and connect with those around them – play a key role in community life. Thus, how and to what degree they stay informed about their communities carries added weight. A new study by Pew Research Center in association with the John S. and James L. Knight Foundation reveals that, overall, the civically engaged are indeed more likely than the less engaged to use and value local news. But two particular aspects of civic engagement stand out as most closely associated with local news habits: a strong connection to one’s community and always voting in local elections. Americans with one of these two attributes, the study finds, consistently display stronger local news habits across a range of measures: news interest, news intake (the number and types of sources they turn to) and news attitudes – their views of local news organizations. This report focuses on five ways the public can connect to civic life and compares the local news habits of Americans who engage in each with those who do not. While these civic factors and news habits are related to each other, the data do not indicate the extent to which there is a causal relationship. In other words, the study does not point to whether civic engagement triggers local news interest, intake or more positive attitudes about local news media, or whether it is, in fact, the reverse. The roughly one-in-five U.S. adults (19%) who feel highly attached to their communities demonstrate much stronger ties to local news than those who do not feel attached – revealing a link between personal connection to these areas and a desire to stay more informed about current issues and events. Nearly six-in-ten (59%) of the highly attached follow local news very closely – about twice the share of the unattached (27%). Fully 44% regularly get community news from three or more different source types, compared with 17% of the unattached. And about a third (35%) think their local media do a good job of keeping them informed – more than double the share of the unattached (13%). Similar to the highly attached, those who say they always vote in local elections (27% of U.S. adults) display strikingly stronger local news habits than those who do not regularly vote in local elections, perhaps a reflection of the unique service local journalism provides in its coverage of local elections and politics. They are more likely to follow local news closely (52% of regular local voters, compared to 31% of those who do not always vote), get local news from three or more source types (38% compared with 25%), follow multiple locally relevant topics (45% compared with 23%), and to approve of the job local news organizations do (27% compared with 18%). Unlike local voting, however, regularly voting in national elections alone does not relate to stronger local news habits. Those who vote regularly in national elections – but not local elections – match those who do not vote regularly in either local or national elections in their more limited enthusiasm for local news. While there is some overlap between those who are highly attached to their communities and regular local voters, these are largely separate groups: Only about a third (32%) of regular voters also consider themselves highly attached to their communities. And just under half (45%) of the highly attached are regular voters. Together, then, the two groups amount to 37% of U.S. adults – and these individuals discuss news more frequently than others, perhaps giving them greater influence on the public conversation about community affairs. Another trait closely associated with broad community attachment is how well one knows their neighbors (23% of U.S. adults), which indeed reveals a similarly consistent connection to all three areas of local news habits. Fully half (52%) of those who know all their neighbors, for example, follow local news very closely, compared with 32% who don’t know any of their neighbors. And 71% say the local media are in touch with their communities versus about half (49%) of those who don’t know their neighbors. 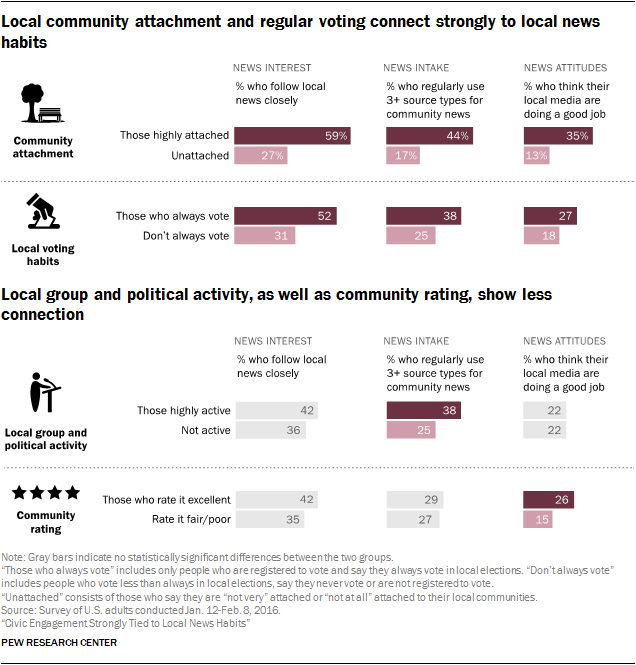 U.S. adults who connect to civic life in other ways manifest stronger local news habits in some areas but not consistently across the board. The roughly one-quarter of Americans (27%) who actively participate in local groups and political activities, for example, demonstrate stronger news behaviors, but not more positive attitudes; just 22% approve of the job their local media are doing. Americans who rate their local communities as excellent (29% of U.S. adults), on the other hand, have more positive views of their local news media than those who rate their communities less highly – about three-quarters of these high raters (77%) feel the local media are in touch with their local communities – but they express few stronger news habits. The one civic factor studied here which seems to have the weakest connection to local news habits is the political diversity of one’s community: The seven-in-ten Americans who say they live in areas with differing political views display very similar local news habits as those who believe most people in their communities share the same political views. While there are a few areas in which small differences emerge, roughly equal shares very closely follow multiple locally relevant news topics and neighborhood news, consume local news via most source types, and approve of the job their local media are doing. What’s more, this finding holds up when examined in terms of one measure of observed political diversity. Those who live in congressional districts where the 2012 presidential election was closely contested show similar local news habits to those living in districts that were not contested. Those who are younger are generally less likely to be highly civically engaged than their elders, and as we have found in the past about news use in general, local news habits are less strong among younger adults. Nevertheless, the relationships we see between local news habits and these various aspects of civic engagement all hold up when controlling for age, as well as income and education. These findings come from a study that asked U.S. adults a wide range of questions about their news habits and attitudes. The survey was conducted Jan. 12-Feb. 8, 2016, among 4,654 U.S. adults ages 18 and older who are members of Pew Research Center’s nationally representative American Trends Panel. We examined five different aspects of civic engagement. Voting in local elections: Those registered voters who always vote in local elections are compared to those who vote less often, not at all or are not registered to vote. Political diversity: Those who see most people in their communities as having different political views are compared to those who see most as having similar political views. Those with high local news interest closely follow news about their local communities, neighborhoods and/or multiple locally relevant news topics such as crime, business or government. Those with high local news intake get community news multiple times a week or more from a variety of source types, such as local TV, local newspapers, word of mouth and local radio. Those with very positive local news attitudes see local news organizations in a good light: they think the local news media are in touch with their communities, do a good job keeping them informed and produce trustworthy information.